“A bottle of white, a bottle of red. Perhaps a bottle of rose instead. ‘The Stranger’ is the complete premiere tribute to the music of the Piano Man himself, Billy Joel. Fronted by accomplished pianist & vocalist Mike Santoro, and backed by some of the finest seasoned musicians in the business, this 6 piece band brings together an authentic replication of Billy’s timeless music, crowning it with soulful, spot on vocals that makes a Billy Joel song what it is. So much so that you will find yourself taking a second look. 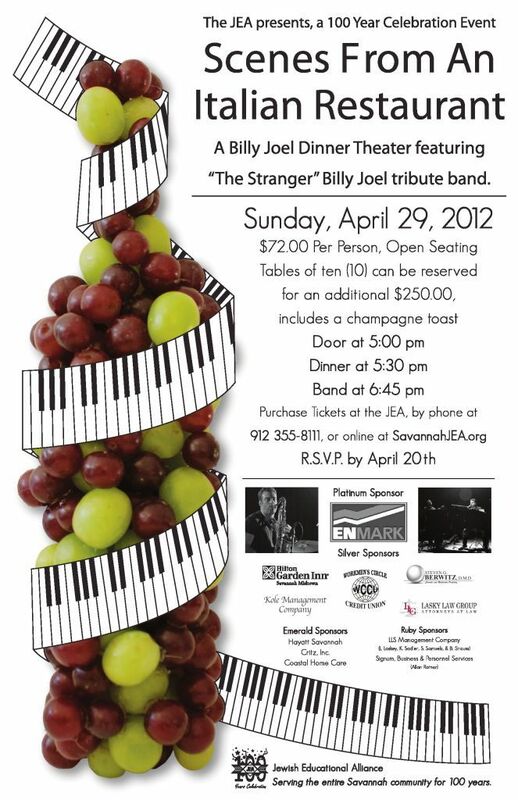 You’re invited to an amazing evening as the JEA is transformed into an Italian restaurant, serving up a traditional Italian dinner with wine and beer, proceeded by a night of wonderful entertainment with music by everyone’s favorite Piano Man, Billy Joel, performed by Mike Santoro and his 6 piece band. Tickets can be purchased at www.savannahjea.org or by calling 912-355-8111. Childcare is available with advanced reservation. This entry was posted on Monday, February 27th, 2012 at 5:14 pm	and is filed under Art/Culture/Entertainment. You can follow any responses to this entry through the RSS 2.0 feed. Both comments and pings are currently closed.